This is an update to my previous posts Baby gear and Baby gear – A follow-up. We got a few more items now that the Little Prince is older, and I thought I’d share some links I found useful. I’ve actually started writing this post in the fall and never got around to completing it, probably because it became so long and unwieldy… So I’m actually going to give you a table of contents of sorts, and you can just scroll down to what interests you. Note that some of the links are affiliate links (meaning that if you were to buy something from my Amazon store, I would get a small percentage, but it would be no extra cost to you). So I did some research to find a car seat that would keep the Little Prince rear-facing ideally until he’s around 4 years old and that would convert to a forward-facing seat, then booster, seat down the road. I loved this list in particular because it factors in your child’s height and weight ratio, though there were also some contenders in this list as well as that article. In the end, we settled on the Diono Olympia Convertible Plus Booster Car Seat, which fit all our criteria and is well-rated by users. It is rear-facing for now, will be forward-facing later, and turns into a booster seat – it’s actually good for 10 years, starting in infancy. As a bonus, its low sides make it easier to get the Little Prince in and out of the seat. Keep in mind, though, that you should check your car manual to see the specifications of your LATCH system, which may differ from those of your chosen seat. On a side note, if your child is over 4 years old, you might want to consider the Mifold instead of a booster seat. I’m certainly keen on getting one for travelling, at the very least, when the Little Prince is older. 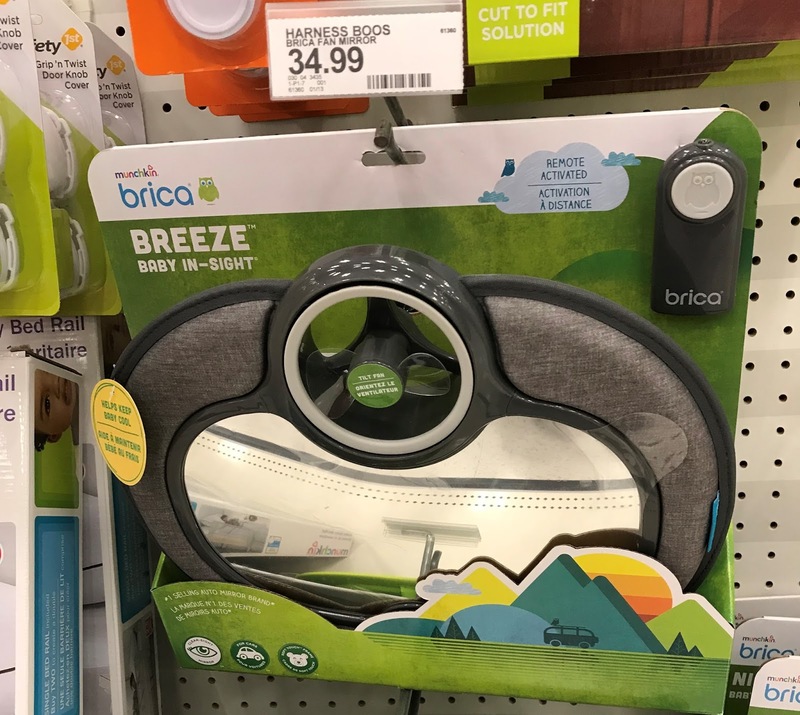 Plus, on keeping your kid cool if the air conditioning doesn’t quite reach the back seat so well (this is a real problem for us here in Texas): we bought a car seat liner, but I honestly couldn’t tell you how big of a difference that makes. The one thing that *was* a lifesaver was this fan that gets plugged in to the cigarette lighter. We clip it onto the overhead handle on the side opposite the Little Prince’s seat. That way, he can’t actually reach the fan or wire, but gets the full benefit of the air. It’s made a big difference in our road trips over the summer, and Texas is hot enough that we even needed it in October and will surely need it in the spring again. The downside is that it wouldn’t work so well if we had two kids in the back seat instead of just one, because the fan really does need to be out of reach to be safe, in my opinion. There are more ideas here, and if you don’t take yourself too seriously, there’s always the noggle. As for books, we are big fans of the classic Goodnight Moon. (This essay explains part of its enduring charm.) The app is also excellent. We also like most books by Eric Carle and Sandra Boynton. If you are in a bilingual English-French family, I strongly recommend the Oops & Ohlala series, where one family member says something in French and another responds in English. If you pay attention, you’ll notice that one of the kids is a girl and one is a boy, but I love that it’s not glaringly obvious. As a bonus, the pages are coated with plastic, making the book more resistant in little hands. Also, I totally got my kid a few books about food. We went with World Snacks, a series by Amy Wilson Salinger, for the moment, and I’ve got a lot more up my sleeve for when the Little Prince is older. Currently, he’s all about First Book of Sushi, Let’s Nosh and Yum Yum Dim Sum (always in that order). I wouldn’t say they are must-reads, but he loves them right now! He’s getting more from the same collection for Christmas. Finally, I recommend anything by Hervé Tullet – his books are translated in English, but we have the original French version of Press Here and Mix It Up and love them. For toys, we tend to prefer things without batteries (though there are always some exceptions). I’m not going to give you a gift guide or anything, but if there’s one toy he’s playing with every day now, it’s a set of magnetized letters. Every kid needs a set of magnetized letters, right? The one we favored was this set by Educational Insights: it has 100 jumbo pieces, with uppercase and lowercase letters as well as numbers and symbols like question marks. (There’s another version with just uppercase letters, but I prefer the expanded set!) Bonus: the set comes with its own storage bin, so your husband won’t have to commandeer one from your already-pared-down Tupperware collection in the kitchen. As with all magnetized letter sets, the magnets can come off and some letters are small enough that in theory they could be swallowed (lowercase “I” and “l” as well as the “-“ sign), so always supervise your child when he’s playing. Apps: New guidelines say that it is fine for toddlers to spend *some* time in front of a screen each day. I’m not getting into that debate in this post. For the Little Prince, we’ve found that judicious use of the iPad is a godsend. First of all, please use a protective case (I highly recommend Griffin’s Survivor cases, which come in dozens of colors and are very durable). Also, start by downloading the free app AppShopper Social, the relaunched version of AppShopper: this app allows you to create a wish list of apps, and when the price drops on one of them, you’ll be notified via email. This is great to take advantage of flash sales you wouldn’t find out about otherwise! We often put the iPad in Guided Access mode to keep our little one playing on the same game (otherwise, he has a habit of opening things he shouldn’t, and on several occasions has locked rotation on my screen and put me in airport mode). Lately, he’s been allowed to wander among the apps in his folder, but needs some supervision to stay where he’s supposed to be. Is there a way to keep him within a specific folder? For older kids, there’s software called Zoodles, which looks like it’s essentially a kid mode with curated educational games, but I haven’t used it yet. I’ll talk about some of the apps that we have for the Little Prince. This list is by no means exhaustive, it’s just what he’s into at this point (almost 2 ½ years old) and what he has been into so far. As he gets older, I find that getting apps that are slightly too hard for him is a good strategy, because then he learns a new skill (swipe instead of tap, match shapes and colors or what have you). - Animal Friends (free, multilingual): find animals, play peek-a-boo on the farm, count. - I Hear Ewe (free, multilingual but no French): animal (and vehicle) sounds. - Peek-a-Zoo ($3.99, multilingual): animals from different environments. The French translation was atrocious, so I sent them a revised text and they fixed some of it. There are also wordless apps in the same family for even younger kids, such as Infant Zoo (catchy music!) and Egg Head. - Busy Shapes ($2.99, wordless): this is was absolutely awesome at first, but the difficulty level increases very quickly and there is no way to set it so that only easier levels come up, even when you delete the progress the player has made. So the Little Prince usually can’t play for more than a few minutes without getting frustrated. - Sago Mini Forest Flyer ($2.99, wordless): this is fantastic. You guide a little bird around the forest, and there are adorable and funny animations all around. Even I had fun with this. Also check out other Sago Mini apps, such as Sago Mini Space Explorer, Sago Mini Ocean Swimmer or Sago Mini Friends – or just get a bundle. - Bamba Burger (free, wordless): I’d had this in the iPad for a year or so, but the Little Prince started playing with this one last month, and now he can’t get enough. There are tons of great sister games, but the annoying thing is that there are ads for all games within the app, so your child will invariably get stuck pressing something that he can’t access or request more games. - Toca Kitchen 2 ($2.99, wordless): cooking meals to serve to one of the various characters. He also just started playing with this and with sister apps, and can’t get enough. There’s also a free app called YouTube Kids. I like it less – sure, the Little Prince can watch curated videos, but there’s a lot of unboxing videos on there and I’m against those for various reasons, so I wish there were boxes for me to check to include/exclude further content. (Like, nature documentaries are cool for kids, but I couldn’t find any. I’d also like videos in French.) Plus, there are ads, so I feel like it defeats the point of an app… It’s also not interactive like the apps I like. All this to say that I’m actually I’m considering uninstalling it. We have a few more apps that I really like but that are a bit too advanced for the Little Prince now, so I’ll report back on those. People keep asking us what kinds of videos the Little Prince watches. We’ve shown him some Baby Einstein and Sesame Street (more to keep him entertained on long road trips and such than for any educational value), but he’s also into almost anything by A.J. Jenkins and loves the alphabet in particular (if you’re looking for higher production value, check out Alphabet Songs by ABC Mouse). He also has a thing for Super Simple Songs like Put On Your Shoes and Do you like… (there are compilation videos out there, too). Most of the videos he watches now are available for free on YouTube. Finally, while we’re discussing toddler gear, I’d like to give you a word of warning against the Sit Seat Travel Harness (the picture is straight from the official product and not mine). It can be used as a travel high chair, but that’s not what we needed it for (we already had a My Little Seat and I had sewn an Anywhere Chair, so we had that covered). The point of the seat, as the name, photo, and official description imply, is that it can keep your baby safely in your lap on an airplane (up until he is two years old, at which point he needs his own seat anyway). This seemed like just what we needed, since the Little Prince wouldn’t sit still in a front-to-front carrier anymore last Christmas. Well, that didn’t happen. We used it on 4 flights, operated by United and Air Canada. On the first flight, the flight attendants marveled over it and said it was the neatest thing they’d seen and they loved it. On all three subsequent flights, I was absolutely forbidden to use it, but when I pressed for a reason, no one could explain the logic behind it. When I got home after that trip, I looked up the airlines’ rules about travel harnesses. The FAA doesn’t require kids’ seats (despite deaths and injuries), though it recommends them. It specifically forbids harnesses for taxi, take-off and landing, but I was forbidden from using in in flight as well! I mean, what about turbulence? Airlines can be fined if they have so much as a box of tissues unrestrained, but children under two are allowed to stay on their parent’s lap untethered – how is this specific harness less safe than that? Wouldn’t it be smart to use it, were it only to protect the other passengers from the projectile your child will become otherwise? United’s policy suggests that the Sit Seat Travel Harness is acceptable, as it does not fall in the “forbidden” category (“The following child restraint devices may not be used on board the aircraft: booster seats, belly belts attached to adult seat belts only, and vests or harnesses that hold the infant to the adult's chest” – and this, by the way, means that front-facing baby carriers aren’t actually allowed, even though flight attendants approved it when we used one with the Little Prince when he was 5 months old; would they be safe in a bulkhead seat?). When I contacted them, the email that I got in response stated: “I regret that I do not know the rational [sic] for this policy. We can only advise as to what is the policy.” As for Air Canada, they forbid “vest or harness type devices”, but when I emailed to ask why, I was not given any information (just the standard “sorry you had a bad experience on our flight” spiel). 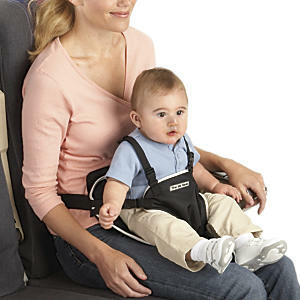 Anyway, now that I’m done venting: If your child is old enough for his own seat (meaning, can sit up by himself) and is over 22 pounds, then I recommend the CARES system, which takes up very little space in your carry-on and is FAA-certified. That’s what we got for our next flight. To conclude this aparté, I’m angry that 1) the FAA won’t step up and mandate safety measures like is the case for cars; and 2) nobody in charge seems able to explain the rules currently in place regarding the vest harness. On our last trip, we schlepped our car seat on the plane. While I am concerned about my kid not being able to stay buckled up properly (more so that we'll get kicked off the plane than because of an accident) my main concern was napping on the plane. My son can still nap in his car seat, and my daughter at the same age could not get comfortable enough to sleep on the plane seat. It was a major pain bringing the car seat (two adults and two kids with four carry-ons, coats, purse and car seat all delicately balanced on an umbrella stroller). I saw another parent had purchased a bag for theirs to carry it like a back-pack. Of course another con is that car seat regulations are different from country to country (this only occurs to me now after we used ours in our rental car in Florida). I also found that the car seat made him closer to the seat in front of him- I still feel bad for the guy sitting right in front of him. But he did nap on 3 of the 4 flights we took, so it was worth it. The reason I would be reluctant to take a car seat with us is mostly, as you have pointed out, that the schlepping is insane. However, after reading what various airlines said on their pages (while researching the issue after our last trip), I realized that a car seat may not fit on every plane (depending on the model of the car seat as well as the model of the plane and your assigned seat). And even IF it does, airlines reserve the right to refuse that you bring your seat on board - they can make you check it at boarding and give it back to you only when you disembark. So to schlep the seat only to risk a) being forbidden to use it and b) having it taken away to stowing only to possibly be damaged or lost/stolen (as once happened with our stroller)... I just can't. I'm looking forward to using the CARES system I bought. That being said, I hadn't considered napping - I guess that's going to be a "fun" flight!